Fortnite Battle Royale to Introduce Remote Explosives | Nerd Much? As Epic continues to tweak their sweet Battle Royale formula, a new item is being thrown into the mix. Remote Explosives are “coming soon” to Fortnite. The Remote Explosives will likely be implemented into the Battle Royale map with the beginning of Week 4’s Challenges. 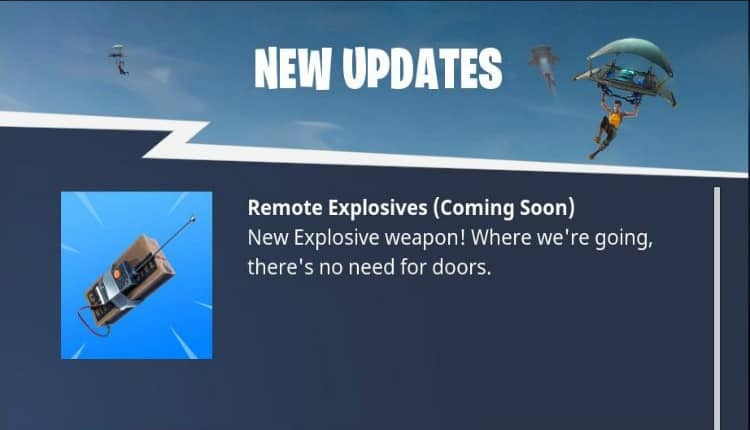 Although unconfirmed, it sounds as though the new explosives will replace the game’s infrequently used Smoke Grenades. New items being thrown into Fortnite Battle Royale isn’t Earth shattering anymore. With each new update, Epic is continually changing things up. The game is still officially in a beta stage, after all. Just recently we’ve seen the inclusion of the Hunting Rifle, the Hand Cannon and the Crossbow. One of the best things about Epic’s development of Fortnite Battle Royale is their flexibility and willingness to shake things up and try something new. The team will likely monitor how the new explosives are being utilized and then determine whether they will remain in the title permanently. It’s up to the community, really, whether items stay or go. Even radical new items find their way into the game from time to time. Fortnite’s Jump Pad was a risky inclusion that turned out added fantastic depth to the game. And the developers have teased that a Jetpack is being incorporated sometime soon. However, that item has been pushed back a few times now as Epic is likely trying to get it right before throwing it into the mix. Fortnite continues to gain momentum across the gaming culture. It’s continually amongst the top games streamed on Twitch these days. And soon it will be available on nearly every major platform of choice.